Robert Mitchum, Ken Takakura, Kishi Keiko, Richard Jordan, Brian Keith, Herb Edelman, Eiji Okada, James Shigeta, Kyosuke Mashida, Christina Kokubo. 112 minutes (Rumoured Japanese Version: 123 minutes). 'Everything's in reverse, isn't it?' Dusty (Richard Jordan) on Japanese culture, to Harry (Robert Mitchum). A Yakuza does his duty. 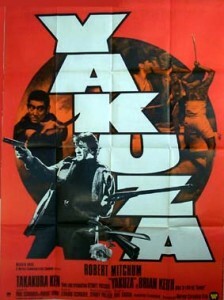 When film critics rhapsodise about how great the '70s were for cinema, THE YAKUZA is very rarely mentioned. The '70s WERE great for cinema, but a lot of low-key films have been laid aside in favour of more high-profile ones. For such a forgotten film, the pedigree behind the film is astonisghingly high-calibre: Robert Mitchum and Japanese legend Ken Takakura (BLACK RAIN, 1989), director Sydney Pollack (Oscar-winner for OUT OF AFRICA, 1985) and writers Leonard and Paul Schrader (TAXI DRIVER, 1976). Robert Towne (THE LAST DETAIL, 1973; CHINATOWN, 1974; SHAMPOO, 1975), probably the most accomplished screenwriter of the decade, 'reworked' the Schrader brothers' screenplay. Great pedigree, of course, does not always equal a great film. But, happily, THE YAKUZA is an excellent motion picture, in which all the key players brought something unique and substantial to the table. 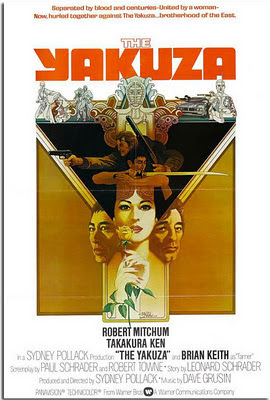 Robert Mitchum is Harry Kilmer, a middle-aged retired detective, with a complicated, bittersweet past in Japan. When his businessman friend (Brian Keith) has his daughter kidnapped in Tokyo by the Yakuza, he asks Kilmer, who has connections in the underworld from his time as an MP there after WW2, to fly there and try to arrange her release. Kilmer is reluctant, but willing to do so - not only to aid his friend, but also for the chance to meet once again with Eiko (Kishi Keiko), the woman he loved during his time there. Kilmer knows that he will have to get in contact with her estranged brother Ken (Ken Takakura), who, upon returning home, was outraged by his sister's affair with a former enemy, eventually becoming a member of the Yakuza. When Eiko constantly refused to marry him, Kilmer decided to return to the USA, buying her a coffee shop as a parting gift. He finds that Japan has changed since he was last there (it has been modernised), and that all he thought he knew about his favour for his friend, and the relationships between Ken, Eiko and himself are not as they seem. Sydney Pollack (coming off the hit THE WAY WE WERE, 1973) was, on the surface at least, an odd choice to direct a thriller with more than it's fair share of action, and a film exploring a very unique culture (Japanese culture) and subculture (the Japanese Yakuza). Looking deeper, however, and also knowing the great job he did on the absorbing, slow-burn spy thriller THREE DAYS OF THE CONDOR (released in 1975, the same year THE YAKUZA was released Stateside), he was a good fit for the material. Pollack brought on Robert Towne (probably at the time CHINATOWN was filming) to make it a film 'more about ideas and not violence', and believed 'the spine of the film is about keeping promises'. Pollack's films have always been concerned with characters under great duress and trying to comprehend the situation they are in (think Tom Cruise in 1993's THE FIRM or Redford in THREE DAYS OF THE CONDOR). Mitchum's Kilmer is a similar character. THE WAY WE WERE had a couple (Redford and Barbra Streisand) striving to respect and love each other despite very different worldviews. Kilmer and Ken are essentially the couple in THE YAKUZA who have to learn how to respect and continue their friendship despite coming from very different cultures and having different worldviews. Films like JEREMIAH JOHNSON (1972), OUT OF AFRICA (1985), which won him Directing and Best Picture Oscars, and even the cross-dressing comedy TOOTSIE (1982) all concern characters trying to adapt to new, challenging lifestyles and learning about themselves as they do. Elaine Lennon, in an excellent piece on Towne's contribution to the film ('A Question of Authorship: ''The Yakuza" ', sensesofcinema.com, issue 37), notes that for Towne, 'thematically the film should have appealed to him: the idea of a loyalty between two men that refuses to die, despite it's unpleasant ramifications...the blending of East and West in a formal gangster film that bases it's structure around the samurai film, which would have proved highly attractive in the aftermath of writing CHINATOWN, which refers to many aspects of Orientalism without providing historical referents; a resurrected romance which proves impossible (this also has it's echo in CHINATOWN); and the mentor-student relationship between Kilmer and Dusty...' Towne saw his job as making the story 'more plausible' and less melodramatic for Western audiences (as he noted, the Japanese Yakuza film is a mix of soap opera and the gangster film), and it would seem his contribution to the final film cannot be overstated. His gift for layering his screenplays with subtext and memorable dialogue is evident in the picture. The scenes between Mitchum and Kishi, and Mitchum and Takakura, come across very well. Casting certainly helped enormously: Pollack, in his commentary, notes that Kishi was a little taken aback by Mitchum's acting style and it helped their scenes seem natural, and Mitchum and Takakura are actors cut from the same cloth (highly charismatic, deadpan, and a fascinating blend of hard-bitten toughness and sensitivity) who are quite simply make an awesome team. Takakura is even more phenomenal if you have only seen him in the Japan-set thriller BLACK RAIN (1989), where he played a meek, by-the-book career cop. He has appeared as Yakuza members in numerous Japanese productions. Like Ken Watanabe in THE LAST SAMURAI (2003), Takakura could not speak English at the time and learned all his lines phonetically, but nevertheless delivers a fantastic, soulful, relaxed performance. It does have to be said though that the scene where Herb Edelman explains Mitchum's lengthy, convoluted backstory to Richard Jordan (who had acted with Mitchum in the excellent THE FRIENDS OF EDDIE COYLE a year previously), whilst stylishly handled (we see Mitchum walking the streets of Tokyo and the backstory is essesntially voice-over), is tough to watch and listen to. A lot of exposition so early in the movie slows down the film and is dull. It would have worked better if we learned the backstory through subtext or more piecemeal. The film has many twists and turns to it's narrative, and lots of incident, so the decision was probably made to ensure a running time not over two hours. Leonard Schrader was a Japanophile who fled to Japan to avoid the draft to Vietnam in 1969 (according to Peter Biskind in 'Easy Riders, Raging Bulls'). He taught English Literature at the Doshisha and Kyoto Universities in Kyoto, but in his spare time was also fascinated by the Yakuza gangster lifestyle, hanging out in their bars at night. When his universities were closed down by student protests, he ended up spending more and more time with the Yamaguchi-gumi, the most powerful Yakuza family in Kyoto. Eventually he decided to write a novel about the Yakuza, but was persuaded by his brother Paul to collaborate on a a screenplay of the material first. Paul was desperately trying to make it in Hollywood, trying to break out of film criticism. They wrote the screenplay in eight weeks and went through three different drafts. It is rumoured that Paul controlled the structure of the piece, and Leonard filled in the gaps. Leonard by this time (the screenplay was finished by January 1973) had returned to the US. Now 28 years old, he was ineligible for the draft. Paul had gotten an advance of $5, 000 from his agent, Robin French, and French had gone around Hollywood's dinner parties bigging up the screenplay (described by Paul as THE GODFATHER with Bruce Lee'). It worked so well that a bidding war started, and offers for their services were abundant. French had the idea to not accept any offers for five or six weeks, and once the auction began, the highest of the reported sixteen bids was from John Calley at Warners for a cool, unheard of $325, 000. Paul Schrader and French took 40% of the money respectively. Leonard Schrader took only 20%., and Paul insisted Leonard only received a 'story by' credit. Paul's other agent, Michael Hamilburg, received a co-producer credit. This was the beginning of a stormy relationship between the two brothers that would get even worse in the aftermath of their fourth and final collaboration, MISHIMA: A LIFE IN FOUR CHAPTERS (1985), after which they ceased talking to each other. Paul later expressed regret over his treatment of Leonard. 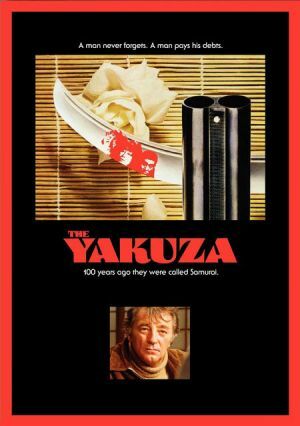 Interestingly, Martin Scorsese had read the script for THE YAKUZA, but at that point in his career (he was coming off MEAN STREETS, 1973) he was not the 'Tiffany' director writer Paul Schrader wanted (according to Peter Biskind). Schrader had written TAXI DRIVER before THE YAKUZA, and Scorsese had just done BOXCAR BERTHA (1972) for Roger Corman at that point. he wasn't considered 'hot' enough to get the film made. Schrader's success with THE YAKUZA was partly responsible for getting the film greenlit (De Niro's Oscar win for THE GODFATHER, PART II in 1974, and Scorsese's hit ALICE DOESN'T LIVE HERE ANYMORE the same year were the other reasons.) The pair would later collaborate on RAGING BULL (1980), THE LAST TEMPTATION OF CHRIST (1988) and BRINGING OUT THE DEAD (1999). Pollack estimates that 95% of the picture was filmed in Japan (in Tokyo, Osaka and Kyoto). Only the opening scene where Tanner (Brian Keith) talks Harry into going to Japan was filmed in the US (in Malibu). The director used many Japanese crew members for the shoot (it was probably insisted upon by the Toei Motion Picture Company, which helped the production), and even a Japanese lighting cameraman, Okazaki Kozo ( Duke Callaghan shot the opening sequence in Malibu. His pastel look to the film (creating a mood of regret) and splendid use of the widescreen frame are assets to the film. The Japanese characters were all played by Japanese actors (some of them being Japanese-Americans). The narrative places equal emphasis on the American and Japanese characters. All this gives the film authenticity, which is complemented by a screenplay that shows real respect, interest and sensitivity towards Japanese culture. Harry ends up cutting off a finger to earn Ken's respect and protect their friendship. Tanner's assistant, Duke (Richard Jordan), is captivated by Eiko's daughter, Hanako (translation: 'flower child') (Christina Kokubo). Wheat (Herb Edelman) loves living in the country. Honour is shown in the film to be the most important ideal to uphold in Japanese society, and it's fascinating in the film to see how it affects the narrative, bringing twists and turns that keep the film compelling, and illuminating in what it teaches one about Japanese culture. In order to maintain honour, sometimes sacrifices have to be made, things left unsaid and drastic actions taken. Nobody is placed above honour, and it's something Harry comes to learn by the end of the picture. The film is quite perceptive about the nature of Japanese people. Both Eiko and Ken have been keeping secrets from Harry for a long time, but it's seen as an honorable thing. 'The truth will out' is not a Japanese philosophy. Unless it serves a purpose, the truth is left unsaid. The truth is often painful and destructive. Despite their sunny disposition and eager to please, the Japanese do not see life through rose-coloured spectacles. They see life as it is. To be respected and liked by a Japanese person is indeed an honour. Loyalty to the ones you love is important, even if upholding honour means you can't actually be with them. Leonard Schrader understands Japanese people and Japanese culture, and Paul Schrader, Robert Towne and Sydney Pollack obviously see great value and interest in them too. It's a great collaboration, and one that looks forward to the successful meeting of minds on TAXI DRIVER - Paul Schrader, Scorsese and De Niro (and also the producers, Julia and Michael Phillips). Although the title of the film promises a gangster film, this is really more in line with a Hollywood version of a samurai picture. 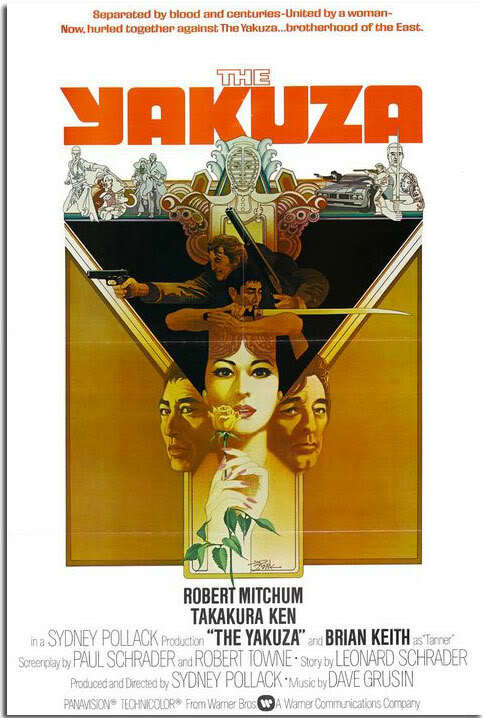 Yakuza films are regarded as modern samurai films anyway, fulfilling a need in audiences. According to Paul Schrader, 'The yakuza-eiga is a popular social contract between the artists and the audiences of Japan to reevaluate and restructure ....traditional virtues' ('Yakuza Eiga: A Primer', Film Comment, Jan/ Feb 1974). Takakura using a 'katana' in the action scenes is a nod to the new genre's debt to the samurai film. THE YAKUZA is essentially, is a drama, punctuated by sudden, explosive, exciting action sequences, and less of an expose on the Yakuza. The film does show how the organisation operates in Japan, but the title is a bit of a misnomer. It's really a film about people. The sight of Mitchum with a shotgun and Takakura with a katana, cutting a swathe through the bad guys is a sight one can never forget. The most memorable action scene occurs in a bathhouse ('onsen'), where a knife-wielding assassin is waiting underwater to kill Harry and a brief fight to the death occurs. It's reminiscent of the later, more elaborate steam room fight in David Cronenberg's superb EASTERN PROMISES (2007), another film that explores a foreign criminal subculture (the Russian Mafia in London). The violence in the picture is interesting in that it's not filmed to appear graceful or clean, and it is never gratuitous. It comes across as happening almost too fast to comprehend, and leaving misery and uncomfortable repercussions every time. The legacy of THE YAKUZA is evident in Ridley Scott's 1989 picture, BLACK RAIN. Michael Douglas is the corrupt L.A. cop who learns about honour and self-respect from Ken Takakura's rigid, incorruptible Osaka cop a la Mitchum and Takakura in THE YAKUZA. The villain of the piece (Yusaku Matsuda) is a Yakuza member, but one who goes against the Yakuza code and is pursued by both fellow Yakuza and Douglas (who escorted him to Osaka after he committed a murder in L.A., and was given the slip at the airport). Whereas Pollack's film was almost almost completely filmed in Japan, red tape forced Scott to eventually return to the USA to film the climax. Whilst entertaining, beautifully made and actually under-valued, BLACK RAIN is a far less deep experience than THE YAKUZA. Like THE YAKUZA, the film is reticent to outright criticise and condemn the crime group. Filmmakers who have done so in Japan have sometimes paid with their lives, but apart from fear of repercussions, it's difficult for films to criticise the Yakuza without criticising a society in which the Yakuza is tolerated and move about openly (their tattoos are a dead giveaway), and in which the police actually work with the criminal organisation. (The Yakuza is said to have been around since the mid-Edo period, approximately three centuries ago.) Given that to film in Japan, Hollywood studios have to work with Japanese studios, and taking onboard the rumour that the Yakuza has some measure of influence in the Japanese movie industry, one can see the difficulties of Hollywood movies getting away with criticising them. It's also probable though, that filmmakers find admirable qualities in the organisation - their upholding of honour which goes back to the samurai code - that also reflect Japanese society as a whole. The film is a highpoint in the careers of all those involved, and somehow manages to be a film that reflects the concerns of a group of individualistic talents in the two Schraders, Towne and Pollack. It's one of the few Hollywood films to treat Japanese culture with sensitivity, respect and most importantly, a sense of interest. For Robert Mitchum, it's one of his best later performances, and the script pushes him to reveal his grace, subtlety and generosity as an actor. Both Schraders went on to further explore their interest in the fates of loners and/ or outsiders in society, something evident here in their first filmed screenplay, and something that would flower with the beautiful MISHIMA: A LIFE IN FOUR CHAPTERS. Towne would continue his interest in exploring loyalty between friends and difficult or doomed romances in various films such as TEQUILA SUNRISE (1988) and THE TWO JAKES (1990, the sequel to CHINATOWN). Pollack, until his death in 2008, continued to make films about characters under duress, often in foreign or alien situations or environments. THE YAKUZA is a hidden gem, and a useful primer for the fascinating, exciting, intoxicating genre that is 'yakuza-eiga', one of Japan's greatest contributions to world cinema. NB. Paul and Leonard Schrader next collaborated on Paul's excellent directorial debut, BLUE COLLAR (1978), and OLD BOYFRIENDS (1979), directed by Joan Tewkesbury. Leonard would go on to write Japanese-language films, one of them - 1975's THE MAN WHO STOLE THE SUN aka TAIY O O NUSUNDA OTOKO - even winning the Hochi Film Awards and Yokohama Film Festival Awards for Best Film. In 1985, he was Oscar-nominated for co-writing the screenplay to KISS OF THE SPIDER WOMAN. He died in 2006 from heart failure, at the age of 62. 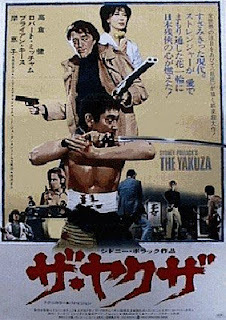 THE YAKUZA premiered in Japan on 28th December 1974 ( in a rumoured 123 minute cut). The US release followed on 15th March 1975. The film was released on UK video as BROTHERHOOD OF THE YAKUZA. James Shigeta later played the ill-fated Mr Takagi in DIE HARD (1988), and also starred in Sam Fuller's THE CRIMSON KIMONO (1959) and Takeshi Kitano's BROTHER (2000), both Japan-themed pictures. The Steven Seagal vehicle INTO THE SUN (2005) was originally intended as a remake of THE YAKUZA, but Warners wouldn't cough up the rights. AVAILABILITY: The film is currently unavailable, but was released on R1 and R2 in a nice looking print, with a vintage featurette and a Pollack commentary. RECOMMENDED VIEWING: BATTLES WITHOUT HONOR AND HUMANITY (aka JINGI NAKI TATAKAI) (1972), BLACK RAIN (1989), BROTHER (2000) and EASTERN PROMISES (2007). 'Easy Riders, Raging Bulls' by Peter Biskind, Simon and Schuster, 1998. 'Tokyo Vice: An American Reporter On the Beat in Japan' by Jake Adelstein, Pantheon, 2009. 'The Yakuza': commentary by Sydney Pollack on the DVD release.